Join members of five churches in the Friendship Community Partnership at New Garden for a great time! We’ll have lunch, participate in table games, including a sweet potato “beauty” contest, and enjoy a talent/variety show. 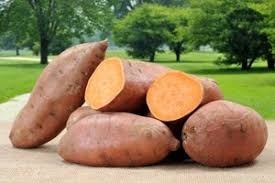 We’ll also have sweet potato dishes for sale – cakes, pies, breads, salads – anything as long as it contains sweet potatoes! All ages welcome. – the craziest looking (raw) sweet potato you can find! perform in the Talent Show.